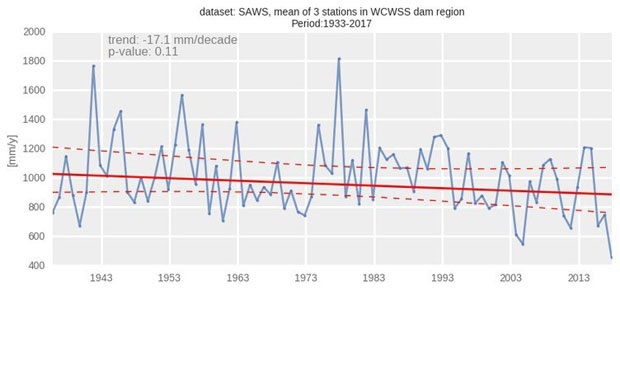 In the age of catastrophic climate change where storms are more violent and droughts more severe [see chart], Cape Town, South Africa faces "Day Zero". That is the day when the metropolis will shut off municipal water supplies. It will be the first major city to run out of water. The city's reservoirs are now at 26% of capacity; the taps will be turned off when they they reach 13.5%. At current rates of consumption, that will be a certainty by April 12th. About 60% of the city's residents are using in excess of 87 litres a day. 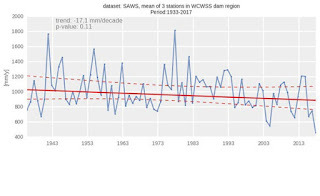 The drought is the worst in a century; but the crisis is also exacerbated by the rapid growth of Cape Town without corresponding additions to water supply infrastructure. Desalination projects and new efforts to extract groundwater are still in the early stages. The city's reservoirs are resupplied by rain water. The city is implementing more restrictive water use regulations in an effort to stave off disaster. It is also planning for transportation of drinking water to collection points for residents where they will have to queue daily to meet their limit of 6.6 gallons per day of water. Queues are already forming at natural springs around the city as residents seek to minimize mains usage and build up emergency supplies. That is the amount the World Health Organization says is the minimum necessary to support humans in an emergency. But it will simply not be enough without extreme rationing; current planning calls for a total city consumption of 450 million litres per day.